VEXpro Ball Shifters provide a battle-proven 2-speed gearbox for easy integration into any FRC robot drivetrain. By utilizing a ball-lock style shifter, this gearbox is capable of “on-the-fly” shifting even when at full throttle. The VEXpro 2 CIM Ball Shifter includes mounting for one or two CIM-style motors. Three carefully selected ratio options allow for maximum versatility. Every aspect of this transmission was designed with size in mind. The 2 CIM Ball Shifter puts a 2-speed transmission into a tiny, lightweight form factor. 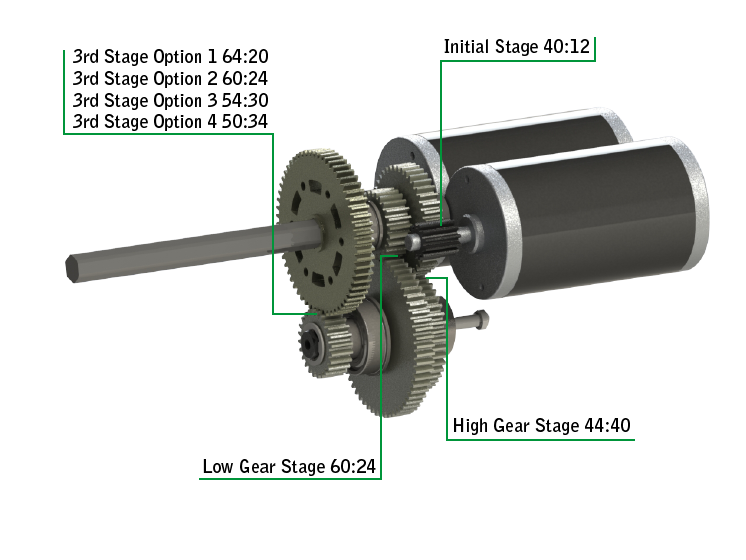 The ball lock shifting method reduces the gap between the two gear reductions and allows for an extremely narrow assembly. The gear reductions were specifically chosen to reduce the overall transmission size and complexity while remaining highly efficient due to the AGMA 11 quality gears with teflon infused ceramic coating. Note: A pneumatic shifting cylinder and fitting kit is not included in the Ball Shifter kit. Be sure to add these below in the "Pneumatic Cylinder & Fitting Options" category if needed. Some of these parts and kits are included with Ball Shifters, check the Kit Contents list below for details. The 2 CIM Ball Shifter 3rd Stage Kit can be used to upgrade an existing 2 Stage Ball Shifter to a 3 Stage version.